Dark and gritty; a unique spin on the original Snow White tale. My name is Snow White, but my mother didn’t call me that to be funny. She would say that the snow covers everything and makes the entire world beautiful. I love a good fairy tale retelling, and this one is truly unique. 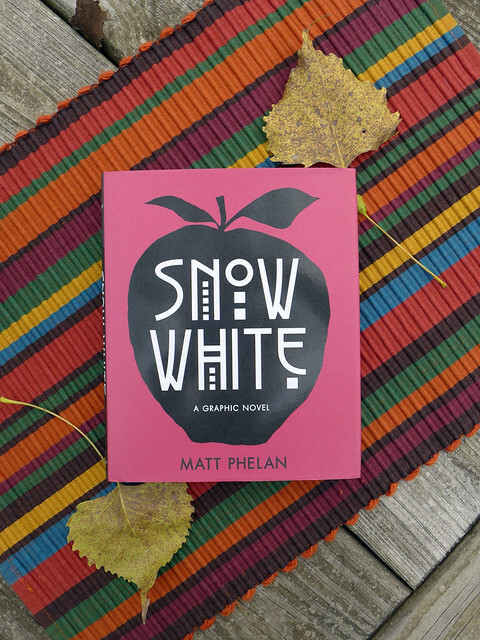 Set in 1920s New York City, Matt Phelan’s Snow White is a gritty comic book adaptation with a decidedly noir spin. Fast-forward ten years. The widower Mr. White, a wealthy stockbroker, is instantly smitten with the newest It Girl, the star of Broadway, the Queen of Follies. They wed, Snow White is shipped off to boarding school, and the family somehow – magically – survives the stock market crash of 1929, which leaves so many of their peers destitute. Everything is okay-ish; that is, until our wicked stepmother receives ominous messages from her husband’s stock market ticker. Before long, Samantha’s father is dead and she’s on the run. From the glamour of Broadway to the shanties of Hooverville, Phelan makes excellent use of the setting. Much of the artwork is rendered in shades of black, white, and tan, accentuating the story’s gritty atmosphere and noir influence. Little pops of color, particularly red – the bright, spotty blood on Mom’s handkerchief; the blush on Snow’s cheeks; the drugged apple she accepts from an elderly sidewalk vendor – call attention to important panels and props. 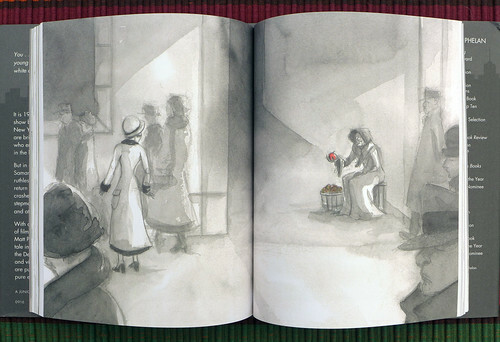 The artwork has a rough quality, much like the streets Snow wanders when she is cast out of her childhood home. Like the artwork, the dialogue is rather minimalist; yet if you are familiar with the story (and what American isn’t? ), you should have no trouble following along. All of the various components – setting, plot, atmosphere, illustrations, and dialogue – work in harmony to deliver a Snow White that’s darker and more firmly rooted in reality than the original. The huntsman is a hired gun; the seven “dwarfs,” a group of homeless street kids. Yet there’s a touch of magical realism in the form of the Queen, linking this tale to its predecessors. Someday, he and Miel would be nothing but a fairy tale. When they were gone from this town, no one would remember the exact brown of Miel’s eyes, or the way she spiced recado rojo with cloves, or even that Sam and his mother were Pakistani. At best, they would remember a dark-eyed girl, and a boy whose family had come from somewhere else. They would remember only that Miel and Sam had been called Honey and Moon, a girl and a boy woven into the folklore of this place. The closer she got to him, the more she felt it in her roses, like a moon pulling on a sea. Miel and Samir are the odd ones out in their small town. In a sea of white faces, their brown skin marks them as different (she, Latina; he, Pakistani); and in this tight-knit community, their outsider status is only compounded by the fact that they were not born here. Sam’s story is somewhat mundane, or so he thinks: his mother, Yasmin, arrived in search of work. Miel’s origins are a bit more fantastical and mysterious: as a child, she arrived on a wave of rust-brown water, spit out by the abandoned water tower when it was deemed a safety hazard and finally brought down. Angry and hysterical (and no doubt disoriented), Miel kicked and screamed; something about losing the moon. Just a child himself, Sam was the only one brave enough to approach this dangerous, feral girl. He wrapped her in his jacket, soothed her with her voice, and returned the moon to her, one hand-painted, candle-lit orb at a time. From that point on, they were inseparable, each one half of a whole: Miel and Samir. Honey and Moon. The cursed girl from whose wrist roses grow, and the boy who everyone insists on calling a girl. The girl who’s terrified of pumpkins and water, and the boy who helps pumpkins grow. But the worst kind of monster was the burrowing kind. The sort that crawled into you and made a home there. My stars, what a lush and gorgeous book! Let’s start with the artwork, which is just exquisite. The illustrations are quite nice, though it’s the vivid, moody colors that really make the panels pop. 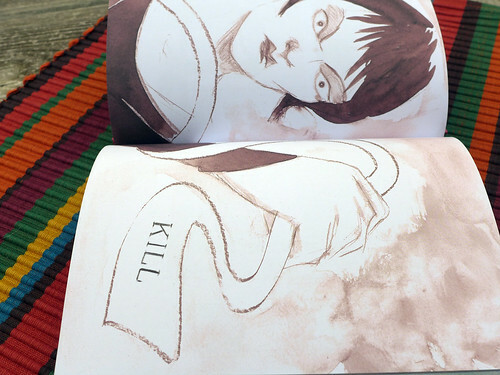 Each of the five short stories has its own distinct vibe, which is no small feat. Whereas “Our Neighbor’s House” is drawn in grey, dreary shades – offset only by the occasional blood red – “A Lady’s Hands Are Cold” is more visually striking, with deep blues, rich golds, and (of course) complementary reds when the horror is unleashed. While each story looks a little different, the artwork (especially the way the humans are drawn) is still similar enough that there’s a feeling of continuity; clearly these all belong to the same collection. Of course this is all topped off by the cover. Not only is the illustration wonderful (the front is awesome; the back, even more so, what with its unexpected pop of blue! ), but the cover is textured for a rich, luxurious feeling. And when the sun hits it *just right*, the bumps sparkle and dance and glint like a knife. And the stories! A hybrid of fairy tales and horror stories, they remind me of the spooky picture books I read as a kid. (In a Dark, Dark Room, anyone?) Creepy and weird and just ambiguous to keep your wondering, well into the wee hours of the night. Suitable for kiddos, but parents? 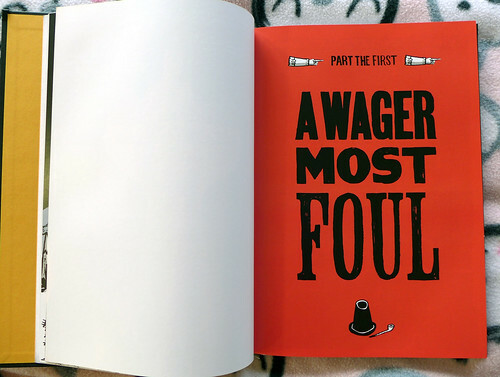 You’ll want to keep this book for your own. Alone in their coracle, they were not performers, not burdens, not dangers, not weapons, not food. They were family. Her whole life she had been afraid of the sea, terrified that it wanted to swallow her whole. And here she was, and it held her. What’s the use of a clown who doesn’t subvert? What do they bring to the crowd? Everyone has sadness, and rage, and frustration – and so everyone needs a clown. Callanish Sand will always remember the bear. She was just a little girl when the Circus Excalibur visited her island, North-East 19 archipelago – home of the sacred World Tree – docking only long enough to put on a night show for the landlockers’ amusement. (And some food and provisions, gods willing.) Everything was going swimmingly (pun intended); the acrobats, fire-breather, and equestrians performed to the audience’s delight. And then the show reached its climax: a veritable bloodbath. Two adults, a man and a woman, performing a courtship waltz with a giant bear, when something went tragically (yet predictably) awry. Even today, Callanish isn’t exactly sure of the what or the why, shielded as she was from the fray by her mother’s steady arms. Before she was carried away, Callanish saw three fallen bodies: those of the man, the woman, and the eviscerated bear. “And in the center of it all, […] two figures: one draped in white, one furred black; both with eyes open moon-round and empty. A small girl and a small bear, hands and paws still linked.” The children of the dead, left to pick up the pieces. It took me seventeen seconds to decide Jarom Thacker’s reputation as the sharpest fighter on Thanda had been exaggerated. At twice my size — and age — he was quick, forcing me to move or risk getting pinned against the cage, but he made a rookie mistake. Like everyone else who came through Mining Settlement Forty-Two, he aimed for my gut. So predictable. Wouldn’t want to botch the pretty girl’s face, right? Idiot. I blocked him on the left, but sweat stinging my eyes blinded me to his fist slamming into my right side. Pain flared through my ribs. The fire spurred me on, and I slipped Thacker’s grip when he grabbed at my arm. Unlike him, I had no qualms about uglifying him further. Princess Snow is missing. Or at least that’s what her father, the cruel and manipulative King Matthias, believes. After a botched assassination attempt by her stepmother, Queen Olivia, “Snowflake” fled her home planet of Windsong, settling on the remote and icy Thanda. Here, Essie – as she’s now known – makes herself useful by “stitching” code to improve the mine’s conditions; she can often be found in the cage, beating miners twice her size to a bloody pulp for extra cash monies to fund her tinkering. It’s not much of a living, but at least she’s alive. Nearly ten years pass before her relative isolation is shattered by the crash-landing of a rogue, treasure-hunting Garamite boy in her backyard. Love the Feminist Fairy Tale Retellings! The description for And They Lived – a collection of nine short stories by Sabrina Zbasnik – sucked me in immediately: “And They Lived isn’t just a dark turn and modernization of the fairy tales. It gives power back to the powerless in the classic stories. Women are no longer the victims and their story doesn’t end with true love’s kiss.” Feminist retellings of fairy tale classics? Sign me up!